Hands off risotto? Yes, please! 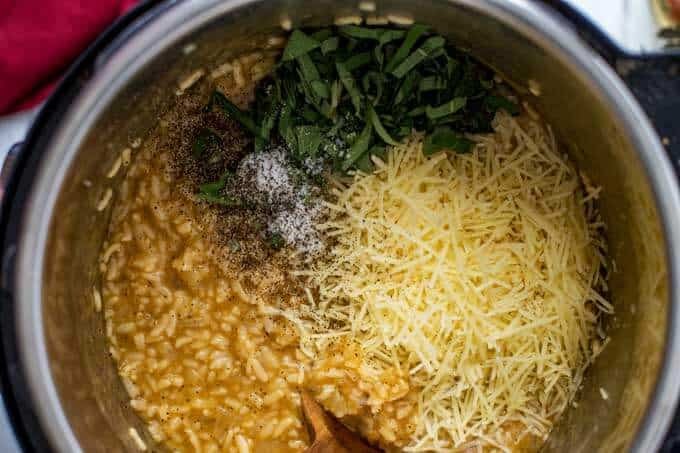 This hearty Pressure Cooker Risotto is the perfect dish for fall! Made with simple ingredients with a kick of cooking wine, this luxurious dish only tastes decadent. This is a sponsored post brought to you by Holland House Cooking Wine. All opinions are my own. I fell in love with Risotto on the first bite. It wasn’t a dish I’d ever had growing up, and I remember the first time I ever had it. I was in my early twenties and got the urge to try something new while traveling for business. We were at a local restaurant that had been suggested by one of my colleagues. It was fall and the Butternut Squash Risotto was calling my name. The rice was perfectly cooked, with just the right amount of bite. The fragrant sage, creamy butternut squash, and kick of wine offered up the perfect flavor. With such a rich and creamy texture, I almost felt like there was heavy cream in there. From that day, risotto became a frequent visitor on my menus. It is the perfect holiday side dish, or even vegetarian main course because it feels so decadent. For a while risotto was off the menu, but lately it has made a comeback at my house thanks to my pressure cooker. This Pressure Cooker Risotto is everything a risotto should be. Creamy, fragrant, and decadent. 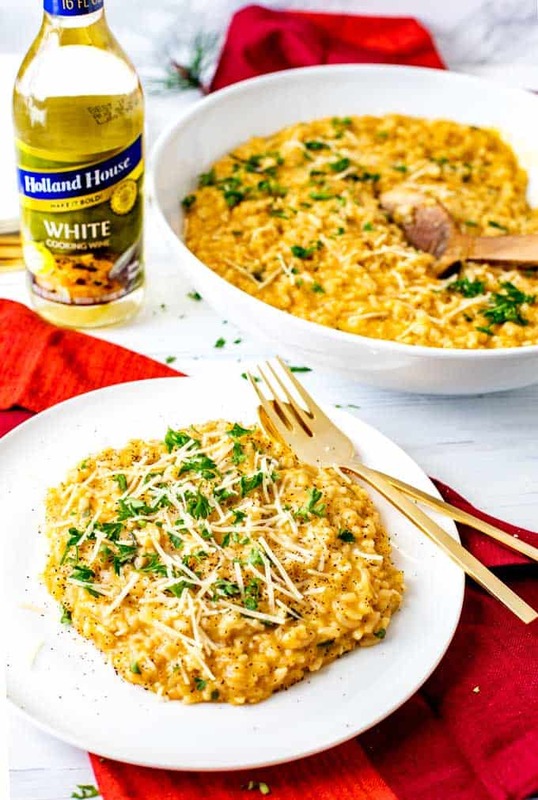 To make this risotto even more flavorful, I rely on Holland House Cooking Wines. They are the perfect way to add a bold flavor boost to any holiday recipe. To me, the holiday season is all about comfort food and entertaining family and friends. 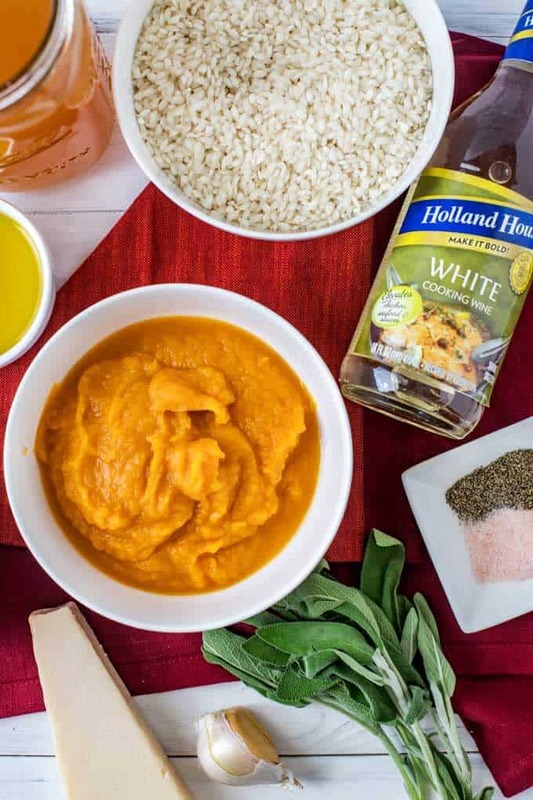 Keeping Holland House Cooking Wines on hand lets me easily add a BOLD boost of flavor to everything from casual weeknight family meals to full on spreads for a crowd. They are perfect for slow cooker recipes, soups, and other cold-weather favorites as the flavors hold up in high heat. And of course, they are perfect in this Pressure Cooker Risotto! 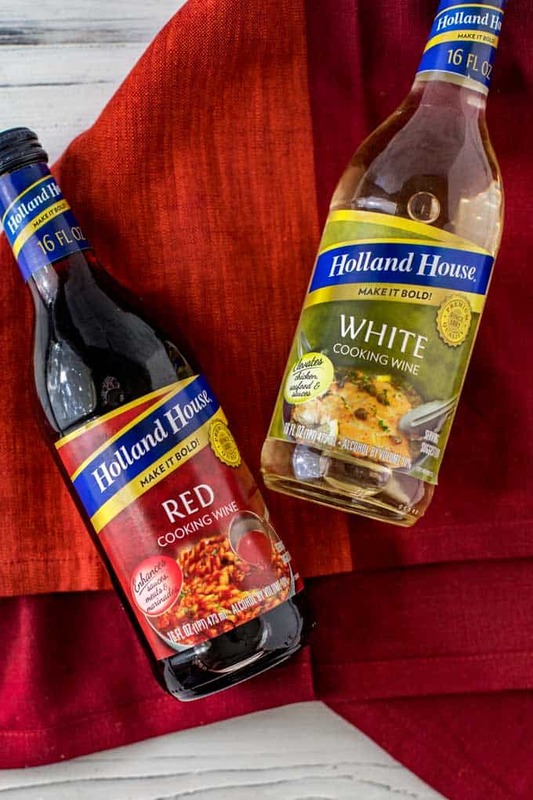 Not all wines hold up to the temperature of an Pressure Cooker, but Holland House Cooking Wines perform beautifully. Marsala Cooking Wine – This has a sweet-wine flavor that is well-rounded and has hints of hazelnut. It is perfect for cooking beef, chicken, and pork. Sherry Cooking Wine – This has a mild sherry-wine flavor with hints of nut and caramel. It is the perfect wine for dessert recipes as it balances with a hint of delicious, nutty flavor. Red Cooking Wine – Has a medium-bodied wine flavor and is perfect for healthy dishes like lamb, beef, and pork. White Cooking Wine – Has a dry, distinct wine flavor that is perfect for bringing out bold flavors in chicken, seafood, and sauces. White with Lemon Cooking Wine – Offers the classic white wine flavor with a citrus twist. It is perfect for seafood. Step 1: Gather Your Ingredients. Chop your onion and sage. Mince the garlic and grate the cheese. Step 2: Place the risotto in the bowl and pour 2 cups of the broth over it. Step 3: Add 1 cup of Holland House White Cooking Wine. Get prepared for bold flavors! Step 4: Agitate with a whisk for a bit to release the starches from the rice into the liquid. The liquid should turn slightly cloudy. Drain, reserving the liquid. Step 5: Add the oil to the Pressure Cooker and add in the onion. Cook for 10 minutes. Add garlic and saute for another minute or so. Step 6: Add the rice to the Pressure Cooker and cook for two to three minutes. Step 6: Measure the reserved broth and wine that you used to rinse the rice with. Add enough broth so that you have a total of 4 cups of liquid. Step 7: Add in cooking liquid, butternut squash puree, and seasonings. Step 8: Secure the lid on your Pressure Cooker and cook on high pressure for four minutes. Step 9: When the cooking time is done, promptly use the Instant release to release the pressure. Step 10: Turn the Pressure Cooker to saute’ and cook until the risotto is al dente. Add additional liquid as needed. Step 11: Stir in Parmesan and sage. Tasted and add additional seasonings as desired. Step 12: Remove the risotto from the Pressure Cooker promptly to prevent over-cooking. 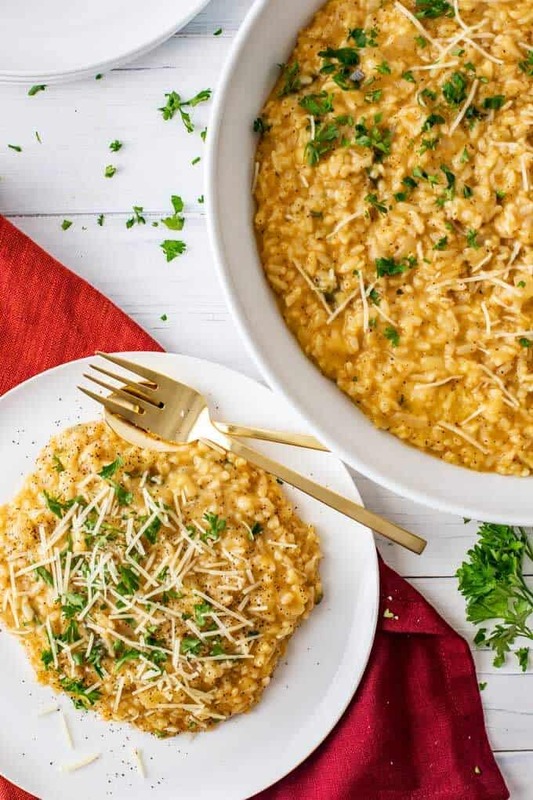 This hearty risotto is the perfect dish for fall! Made with simple ingredients, this luxurious dish only tastes decadent. 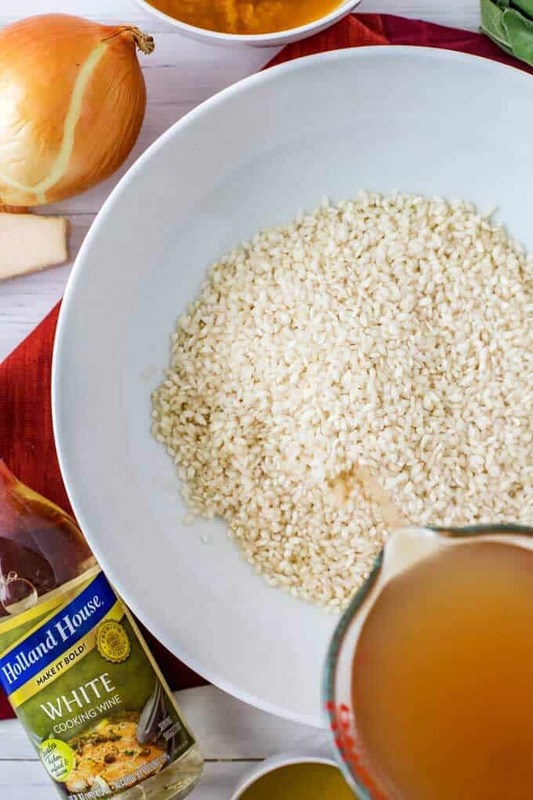 Place rice, 2 cups of broth, and 1 cup of Holland House White Cooking Wine in a bowl. Use a whisk and stir for about 20 seconds. Drain, reserving the liquid. Select sauté and preheat your Pressure Cooker. Add olive oil and onion and sauté for 10 minutes. Add garlic and cook for another two minutes. Add the rice to your Pressure Cooker, and cook for 2 to 3 minutes. Measure out the reserved broth and wine that you rinsed the rice with. Add enough broth so that you have a total of 4 cups of liquid. Stir in butternut squash puree, salt, pepper and cooking liquid. Place the lid on your Pressure Cooker and make sure that it is sealed for pressure. Cook on high for 4 minutes. As soon as the 4 minutes is done, use the quick release to release pressure. Return the Pressure Cooker to the saute mode. Saute the rice for 3 to 5 minutes, stirring briskly. Add the reserved broth, 1/4 cup at a time, only if it is needed. Stir in the Parmesan and sage and cook until the cheese is melted. If you would like to make the dish heartier, stir in shredded cooked chicken or chopped cooked sausage at the end. Don't have a Pressure Cooker? You can make this recipe in your slow cooker! To do this, heat a saucepan to medium and complete Steps 1 to 4. 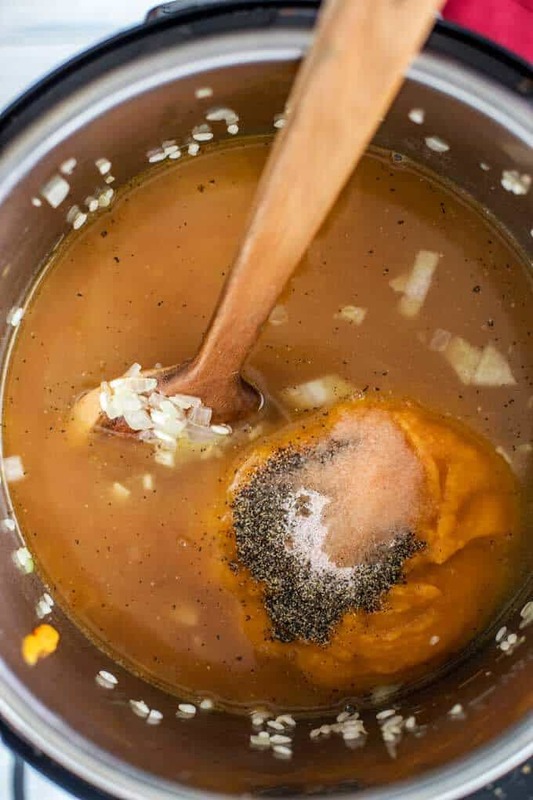 Add everything to your slow cooker and cook on low for 4 to 6 hours. Make sure you keep an eye on it towards the end, and add more liquid if needed. Increase to high, and stir in the Parmesan and sage. 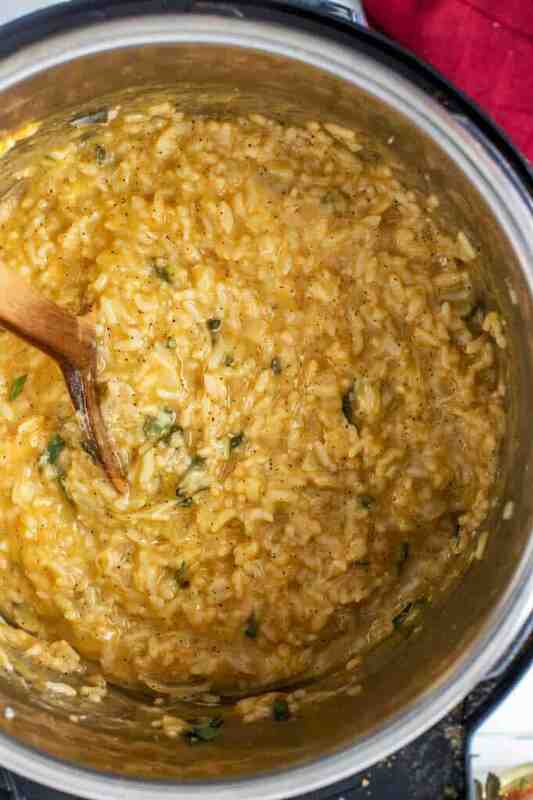 Part of the flavor from risotto comes from toasting dry rice in fat before adding liquid. (This is similar to toasting quinoa.). It gives it a nutty aroma that you will love. However, when you toast the rice, you lose some of the starch. This can result in your final dish not being as creamy. 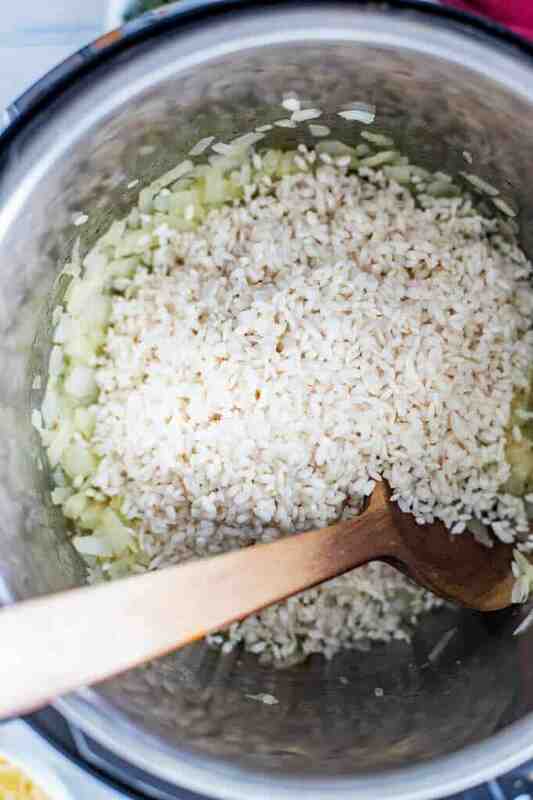 Try rinsing the rice with the stock you are planning on using so that the excess starch ends up in the broth. This allows you to toast the rice and not lose the thickening power of the starch. For the best possible risotto, remove the finished dish from the Pressure Cooker Immediately. If you leave it in the pot the heat will turn it into mush! Risottos texture relies on using the correct rice. The best rice for risotto is Arborio rice. It is a short grain rice that has the ability to achieve the perfect al dente texture for risotto. Other possible substitutes include sushi rice or farro. I've made Quinoa Risotto before, and while lovely, it is impossible to achieve the same texture that you do with rice. 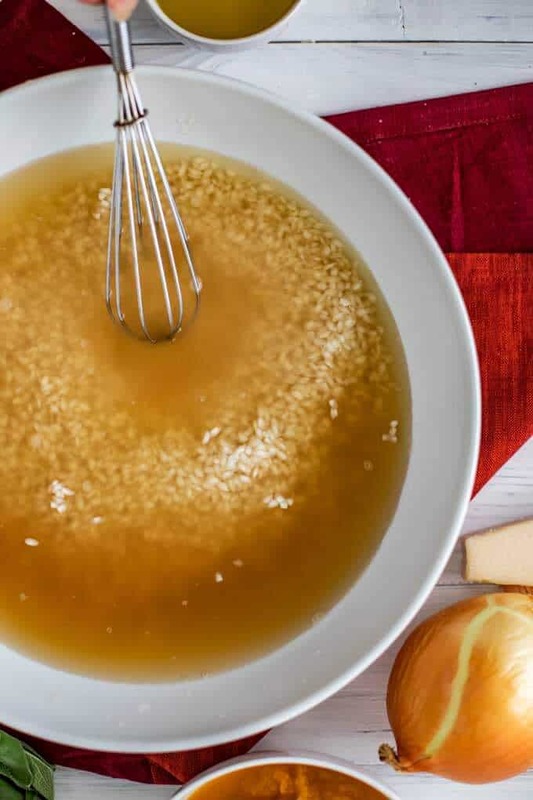 For the most flavorful risotto, start with a flavorful broth. (And don't skip the wine!) I like to make my own broth because in my opinion, nothing can compare to homemade. Looking for more delicious recipes and tips? Then be sure to follow Holland House Cooking Wine on both Facebook and Pinterest! Don’t forget to visit the new Holland House site to download a redeemable coupon for your next cooking wine purchase! Do you drain the rice before putting it in the pot? One minute it’s soaking in broth and wine and the next it looks dry in the pot with the onion. I assume you drain it and reserve the soaking liquid? Otherwise looks good and will save me some time. You do drain it, but reserve the liquid. It is at the end of step one in the recipe. That sounds like the perfect fall side! I’ve never had risotto like this before. BUT I love squash so I know it will be a winner. This looks delish! Perfect for the holidays or any day of the week! I’ve had limited success in making risotto. Perhaps it’s time to switch it up, and use this recipe with my pressure cooker! Never thought of that! This looks like such a great recipe! I love risotto! I can’t wait to cook this for my family! 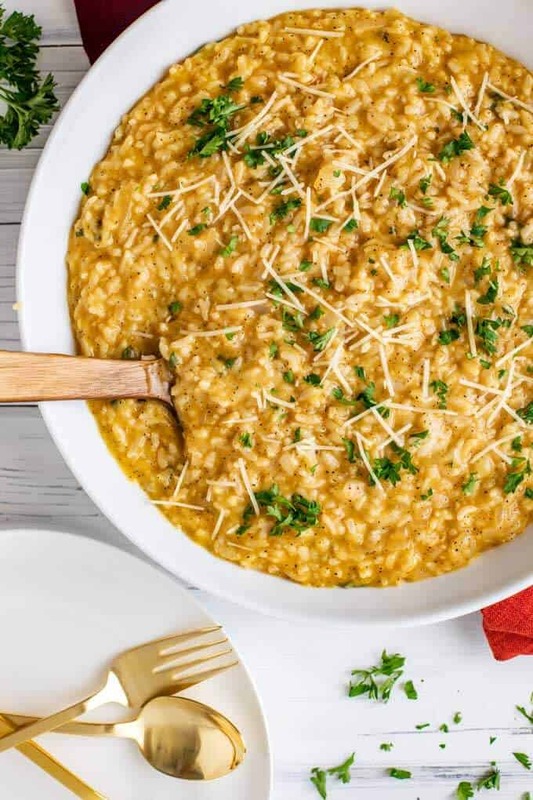 This looks like a perfect dish for those who love risottis and white wine.. Defintiely something to consider at the family gathering when showing off cooking skills. This looks great. I bet my husband and I would really enjoy this. It looks super tasty. i’ve never had risotto before. I bought some risotto and I have yet to cook it. I haven’t ever had it. I’m feeling motivated to whip it out now. I have never tried risotto. I love making dishes in my pressure cooker and always welcome new recipes. 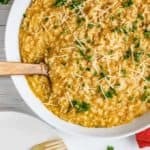 I love risotto and this looks delicious! I need to try this recipe soon.